This material may be used for personal research only and not for commercial purposes. Since 2002 members of Darlington Historical Society and other volunteers have been recording the inscriptions on the headstone in the West Cemetery. Another group of volunteers have transferred this information to the web site database. The headstone database is currently being redeveloped but a temporary version may be accessed on the About Darlington web site. Up to the end of 2011 we have recorded and entered into the data base information from over 8800 headstones resulting in over 20,000 individual records on the data base. Recording and data entering continues. Whilst every attempt has been made to ensure that these records are accurate some errors will have occurred during recording and transcribing. If you do find an error please advise the Darlington Historical Society in order that we may correct it. If you have found this database of use please let us know by posting a comment on this page. In addition to the inscription on the headstone they have recorded the location, the shape, the condition, and where available the cemetery reference number and the name of the mason who made the stone. 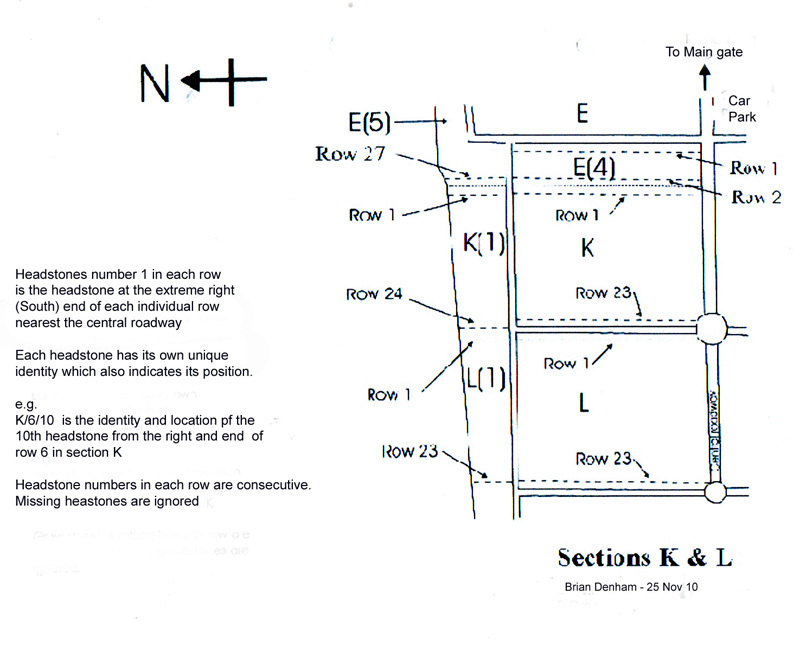 Also available is a drawing of the whole cemetery showing section identification letters and individual drawings are available for each section indicating how rows and headstone numbers are to be found. 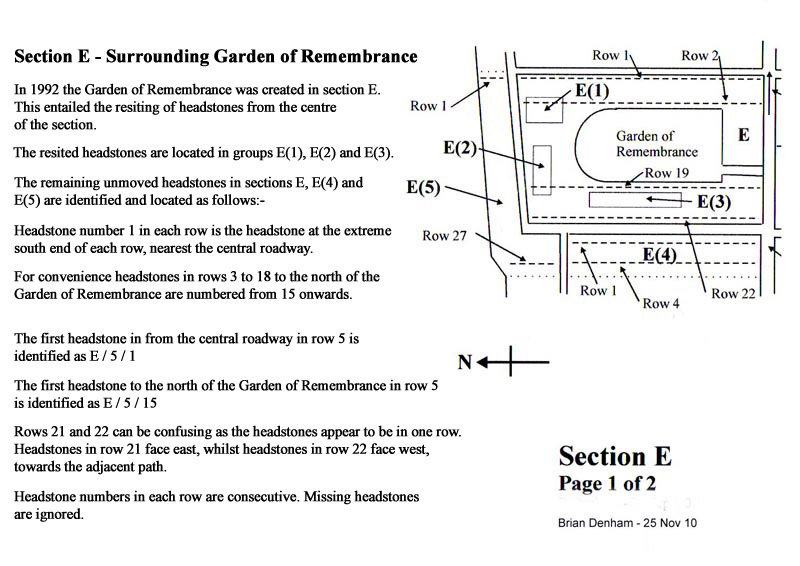 Headstones are identified by section letter, row number and headstone number in a row. Headstones are consecutively numbered as existing at the time of recording, and missing or new headstones are omitted from the sequential numbering. Headstone number one is usually the first existing headstone in a row nearest to the central roadway. 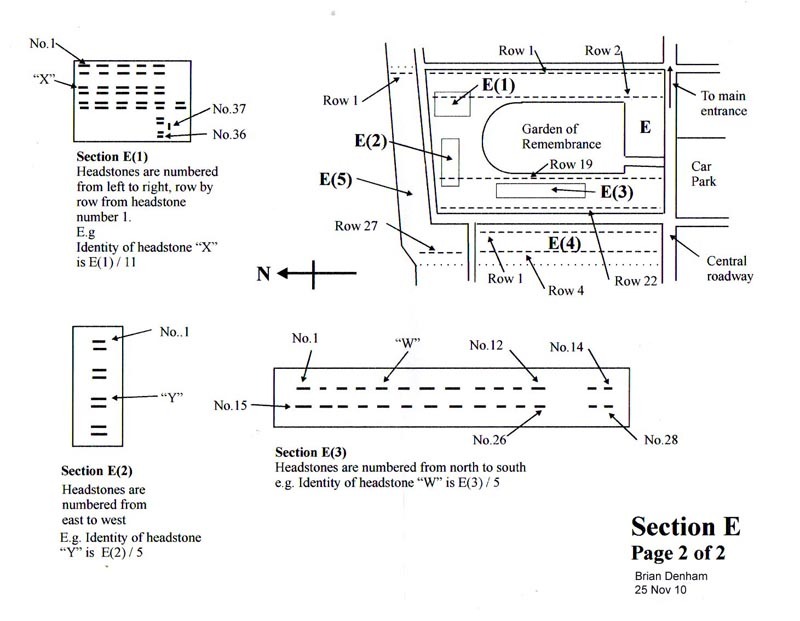 There are some exceptions to this but the exceptions are noted on the individual section drawings. The headstone being identified by the section letter then by the row number and then by the headstone number in that row. The West Cemetery headstone data base can be search by selecting the link which will transfer you to the internet web page. View the temporary headstone database on the About Darlington web site. If you now wish to locate the actual headstone in the cemetery make a note of the section letter, the row number and headstone number. 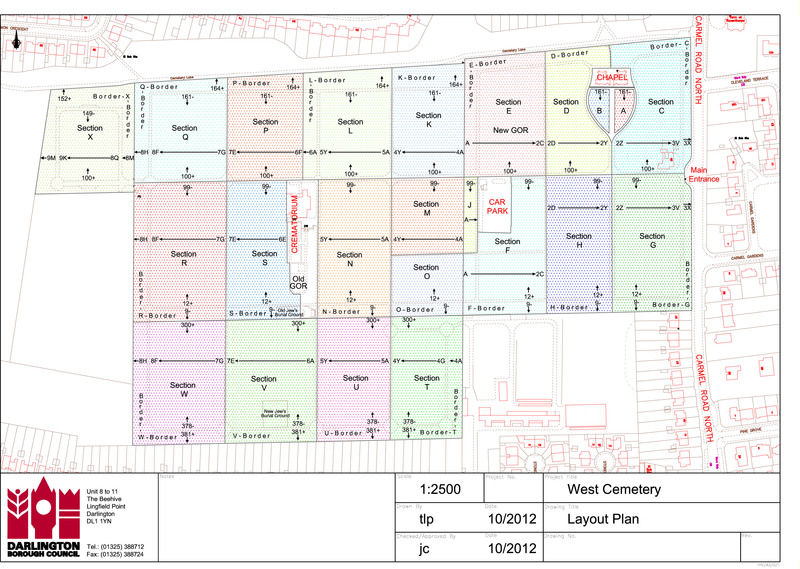 Using the “section plan” as a guide, locate the headstone you require. Row numbers start at the end of the section nearest the main gate. Headstone number one in any row is usually the first headstone in the row nearest the central road way ( From main gate towards the crematorium). 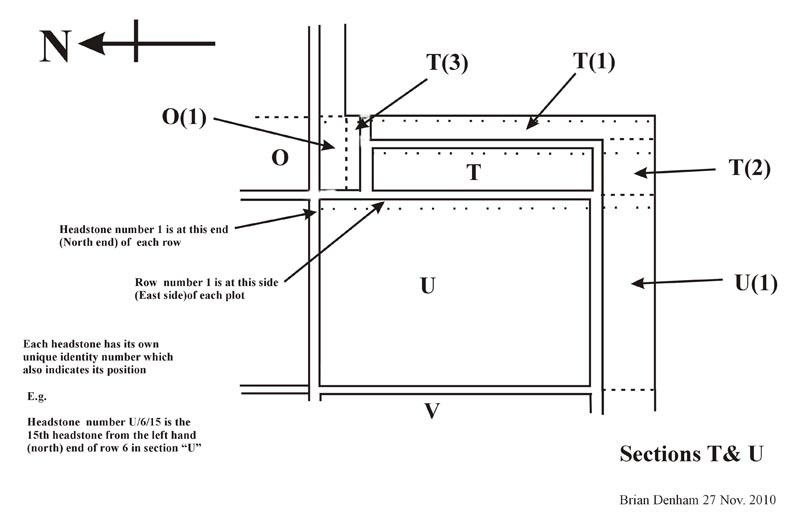 There are exceptions to this rule but any exceptions are noted on the individual section plans. Headstone numbers refer to headstones seen at time of recording and do not refer to plots where there are no headstones . The plans will open in a separate window. Please click the images below for a full size plan. 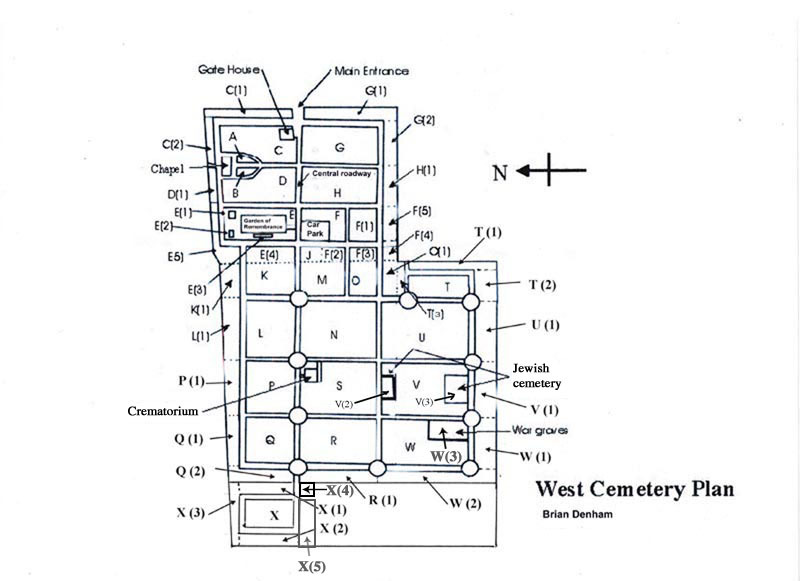 West Cemetery Plan shows the position of the various sections within the cemetery. 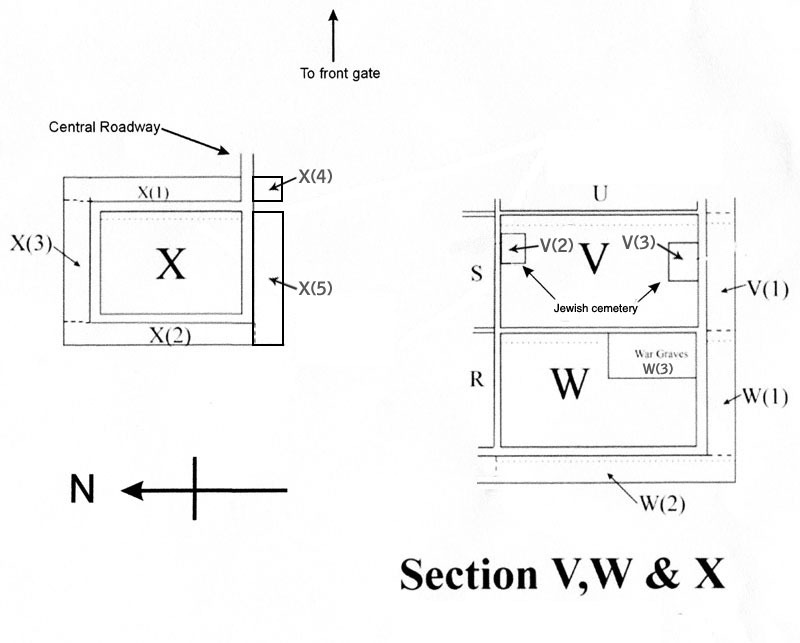 Plans of individual sections provide more detailed information for each section. If the person you are looking for died on active service you will find their details on the Commonwealth War Graves Commission web site. Information includes those people laid to rest in Darlington cemeteries. If you have a specific question regarding a relative whom you think may be buried in West cemetery can you please post a comment on this page. We will try and help in anyway we can. The Darlington Historical Society numbering system refers to existing headstones only. The Council cemetery numbering system refers to actual grave plots which may or may not have been used and may or may not have a grave stone. Whilst the two systems have similar features they cannot be related to each other and that is why we have written the following explanation of the council Cemetery plot identification system. Each cemetery plot has an identification number such as N/5B/110 which means it is in section “N”, Row 5B, Plot number 110. Sections and associated borders are identified by a letter. Rows are identified by a Number and Letter. The rows are identified sequentially by letters of the alphabet. The associated number indicates the number of times the letter has been used. 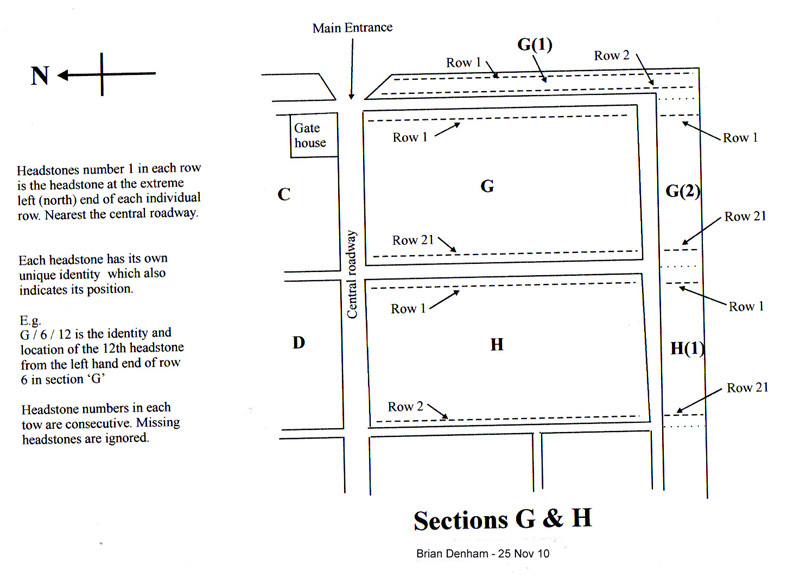 e.g .In section R the first row nearest the entrance is number 7G. That is the 7th time the letter G has been used to identify a row. Rows run north to south continuously across all sections, including borders. 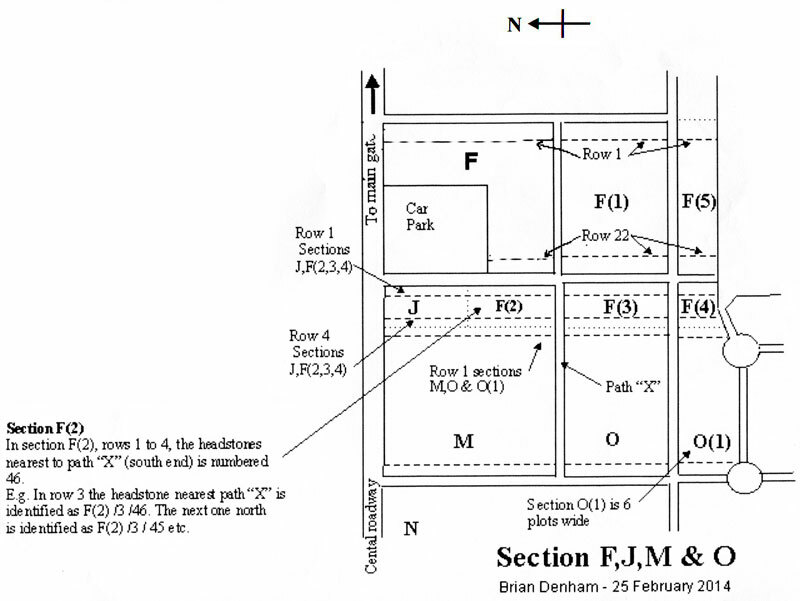 In sections A to J the row lettering system runs from west to east (towards the main gate) because they were the original sections when the cemetery was opened in 1856 . The first row, row “A”, is at the west end of sections E, F & J. Which because of alterations, when the east end cemetery wall was removed and the cemetery was extended, is now the fourth row in section K,M & O. In section “K” onwards the row lettering system runs from east to west (away from the main gate) and starts four rows west of north south path in sections K,M & O. 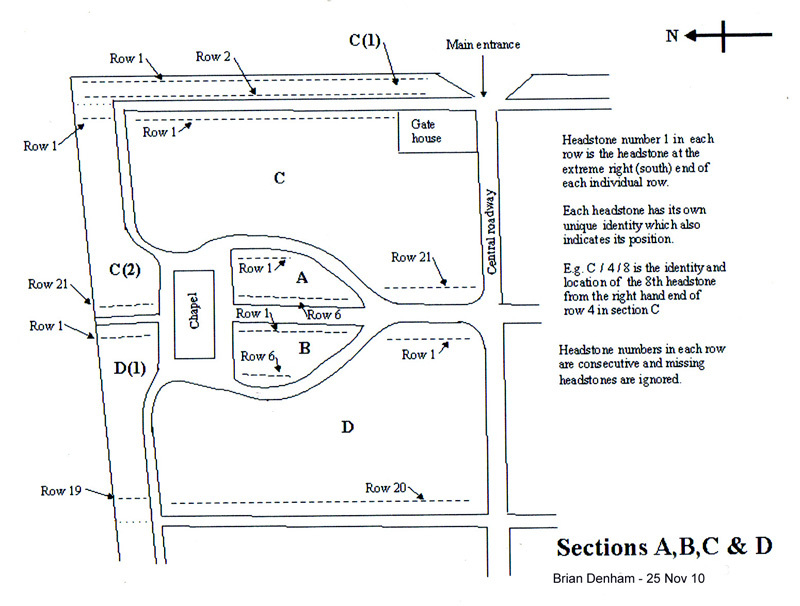 Plot Numbers with the exception of sections T,U,V & W are all numbered from the central roadway. Looking east towards the main gate the first plot to the left of central roadway (north) is number 99 and then decrease. Looking east towards the main gate the first plot to the right (south) is number 100 and then increase. Number 300 in each row, is three plots in from the east west path to the north of plots T,U,V & W due to there originally being a border and a wall to the south of the east west path north of sections T.U.V & W.
If you have the plot number of the grave you wish to find the best procedure is as follows: using N/5B/104 as an example. c) In section “N” look at a selection of headstone and find one with the grave plot number engraved on the back. Using that row number as a starting point locate the row you require (5B). d) Walk along row 5B until you find a headstone with plot number 104. You will be very lucky if you do find one with the correct number. I must thank your and your fellow members for all the hard work you have done on the Inscriptions at West Cemetery. It is of invaluable help to Amateur family genealogists like myself, in tracing our long lost Ancestors. I would never have found the stones and important birth/death dates without your detailed plans and descriptions. I intend to return and clean the stone of the one I have just found. The names were obscured with green slime, as it is under a tree. It is such a wonderful cemetery, and the trees and shrubs are amazing….. It’s like a walk in the park! Great work volunteers. Very helpful for those of us ‘down under’ (New Zealand). Hope you have another project underway. Thank you so much for your detailed work. After many years of searching I have found a number of family graves which have answered a number of questions. I do not come from the Darlington area so these are a fantastic find. I shall share your site and what I have found with a new found family link living in Australia. Thank you. Thank you Darlington Historical Society for the work your volunteers have done in transcribing the headstones. I have found my great-grandparents and a great-aunt, who was also a step-great-grandmother of mine! Also found my great-great-grandparents and a great-great-aunt, her husband and son. Cannot thank you enough. I live in Canada now and when I visit England I always visit West Cemetery to freshen up my relatives grave sites. I found your website fantastic being able to find my relatives so easy and it is nice to see all the detail put into it with the inscription of the headstones recorded like that. Great job!! Thank you so much to your volunteers and Historic Society…I can tell a lot of time and care has been put into that project. Just wanted to say thank you to everyone involved with recording the graves in West Cemetery. I have been able to find my gtgrandfather and his second wife and supplied me with birth dates as well the dates of their deaths. Your hard work is very much appreciated. Wonderful work and so very important. I do regularly visit the family graves in the West Cemetery and it is very sad to see how many are now left to nature..My family are located in the old part and so thrilled to see their names on your database. Many thanks indeed.